Interested in this Regal, or want more info? Fill out this form and we'll get in touch with you. This fresh water Regal 3060 Commodore is kept undercover in Grafton Harbor on the Illinois River. It was buffed and waxed Summer 2018 and is in great shape. The spacious cabin is clean and like new. There is plenty of room to entertain your guests in the cockpit as well with wrap around seating in the aft, a removable table, and a wet bar with a fridge/freezer combo. 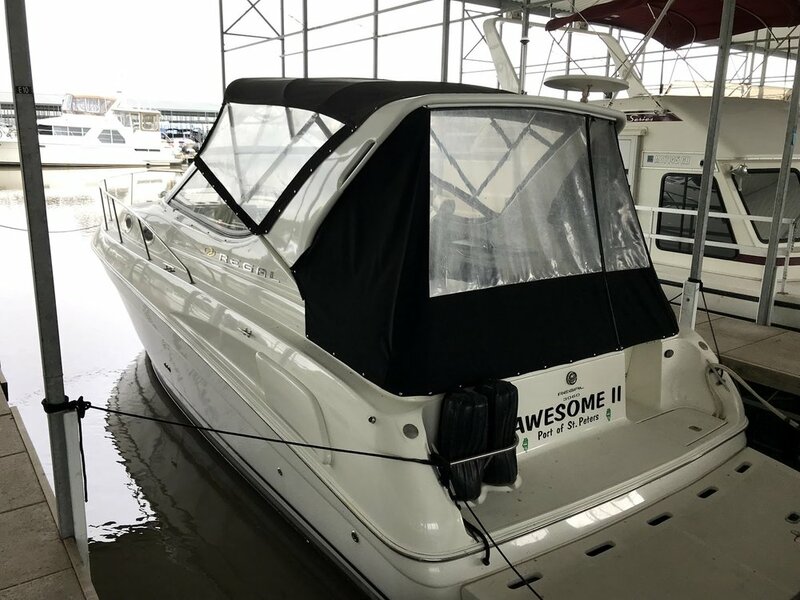 This Regal comes with a full Cockpit Enclosure with Eisenglass to keep you comfortable on the cooler days on the water. If you need to get to places in a hurry, the 3060's Twin Volvo 5.0's can crank out 520 Horsepower to push you to 43 Knots. Or, when you are looking to relax, drop anchor with ease using the anchor windlass and enjoy the sun on the massive swim platform! The seller is motivated to sell quickly, so make an offer and don't miss this one!